"A land without a people for a people without a land," the usurpers dissembled. and a house with many windows. "There is no such thing as a Palestinian people… It is not as if we came and threw them out and took their country. They didn’t exist." And Fadi Abu Sada was scared because seqestered in his Bethlehem house he thought that the noise from the firecrackers of the settlers celebrating their independence were bombs destined for his house, and the metaphor is apt...they dance on our graves. Do these settlers care about the effect of their revelry on the indigenous population? Do they feel remorse for actions of the past and present Zionists? In the years to come, I think the history of the Jews will probably not be marked by their historical role in the fate of Jesus Christ. That was a matter of religious interpretation of an event which took place 2000 years ago. The old will die, and the young will forget, speculated David Ben Gurion. dreams showing me my village. the aroma of apricots in my fields. "And teach the sky, too, to forget to rain." My father closed his eyes. "Only then, may I forget my country." 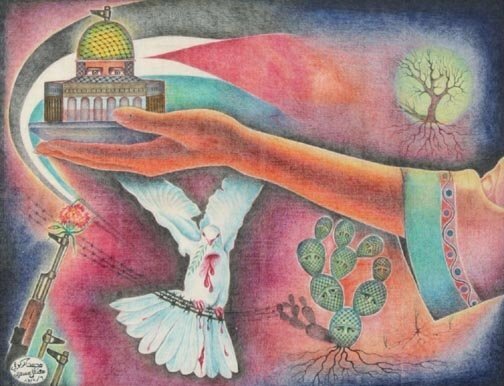 Palestine is my land, and I won’t let you take it – and while you put the world to sleep, I try to wake it.